Compare 111 HTC Titan pay monthly contract mobile phone deals. Compare 2 HTC Titan sim free/unlocked mobile phone deals. 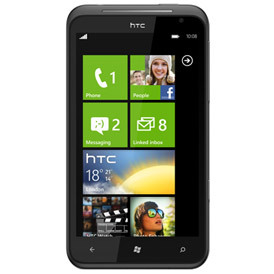 HTC launch a second round of Windows Phone 7 devices spearheaded by the mighty HTC Titan. Actually running Windows Phone 7.5 (aka Mango) with a range of updates and improvements to the new Microsoft operating system. The HTC Titan boast an enormous 4.7 inch screen, an 8 mega pixel camera and a 1.5GHz processor to keep you entertained and informed. No one has yet rated the HTC Titan. Click the link above and score it out of 5 based on how awesome you think it is. You can also leave a few comments or write your own review.